Gather Test Cases into test jobs to create regression, functional, sanity and other kinds of test procedures. Launch tests on distributed targets using Coronys Suite™. 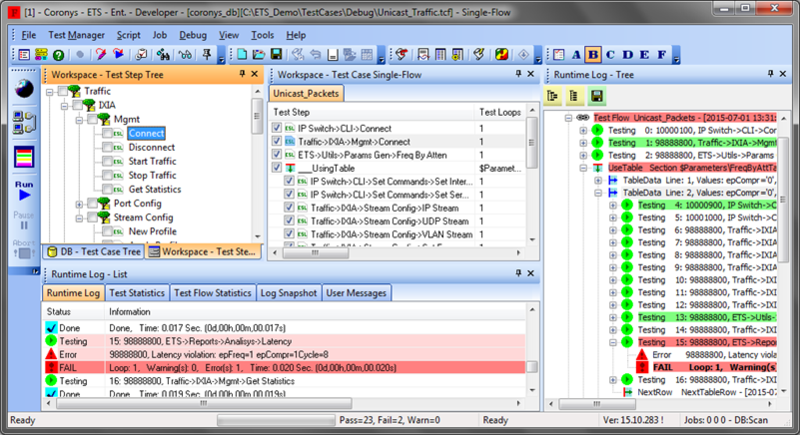 Synchronize parallel execution with rendezvous sync points. Run single and multiple tests from ETS by click, submit as jobs from command line. Customize ETS menus to fit different users. Control multiple test stations from a single point remotely. Share your LAB equipment load to optimize its utilization. Define manual and automatic inputs for entire test or its parts. Pass data structures and test results from one step to another. Use Coronys Suite™ to create test jobs. Arrange test cases in a job according to their execution order. Add loops, retries, parallel actions and other conditions to form the entire test procedure. You’ll be able to launch jobs from Suite™ or as a part of your Continuous Integration process. 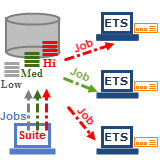 Each ETS manages its prioritized queues for test job requests. Submit your Test Case from ETS UI as a job and ETS will start it automatically as soon as possible. Specify priority, date and time to be executed, specific job parameters, etc. 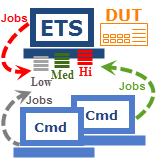 Use CmdToJob command line utility to post jobs on remote ETS stations. This way you can to launch automatic testing from your Continuous Integration procedures. With Coronys Suite™ you gather Test Cases into one integrated process and post the process job on Coronys Server prioritized queues. Idle ETS stations poll remotely the queues and take jobs for execution. You can specify a particular or a list of ETS stations to run a job. The Suite™ allows to define groups of Test Cases as independent tasks running in parallel with sync points to continue just as all tasks completed. 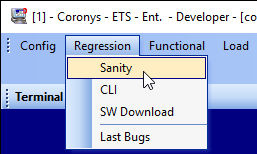 Choose your way to run tests from Coronys ETS GUI. Click on Run button to generate and run currently open test case. Customize ETS menus to provide your own User Interface recognizable by other testers. Six customizable TODO buttons are useful to start predefined operations. This feature is available also in the “Runner” Edition so you can utilize it for production line automation.